The Federal Farm Credit Banks Funding Corporation is an integral part of the Farm Credit System, a leading provider of loans, leases and services to rural communities and U.S. agriculture. The Farm Credit System is a government sponsored enterprise, created in 1916 and dedicated to assuring a steady source of financing to qualified borrowers. The System touches everyone's daily life by financing operations that provide America with high quality agricultural products and services. As the Farm Credit System’s fiscal agent, the Funding Corporation is responsible for issuing and marketing debt securities to finance the System’s loans, leases and operations. The System has a unique and highly successful cooperative structure. As a cooperative network, ownership begins with our borrowers. Farm Credit System Associations (Associations) offer loans, leases and financial services to qualified borrowers. 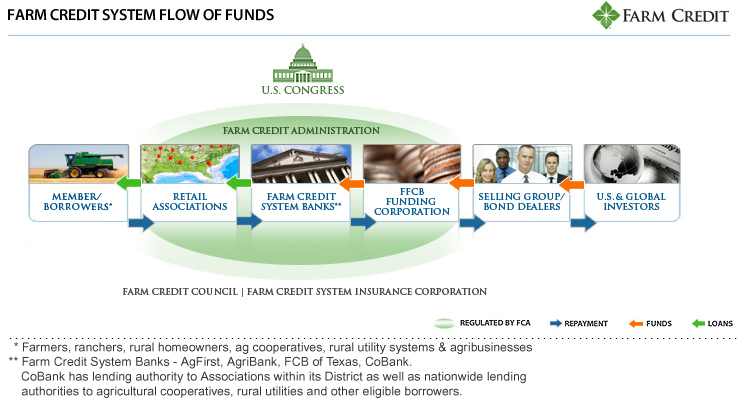 Farm Credit System Banks (Banks) provide capital to those retail Associations. In addition, CoBank (one of the System Banks) provides direct financing to large agribusinesses, cooperatives and rural utilities. The Funding Corporation issues highly rated notes and bonds on behalf of the four Banks of the Farm Credit System: AgFirst FCB, AgriBank, FCB of Texas and CoBank, ACB and partners with a select group of dealers to market and distribute the securities to investors in the United States and around the world. The Funding Corporation also manages the System’s investor relations program, meeting with current and potential investors to educate them on the System’s mission, current financials, debt issuance patterns and overall agricultural and credit market conditions. In addition, the Funding Corporation provides consulting, accounting and financial reporting services which include the preparation of the System’s Annual and Quarterly Information Statements and serves as the System’s disclosure agent. All institutions in the Farm Credit System, including the Funding Corporation, are examined and regulated by the Farm Credit Administration, the System’s safety and soundness regulator. The Farm Credit Council represents the System before Congress, the Executive Branch of the United States Government, and others. The Council provides the mechanism for grassroots involvement in the development of System positions and policies with respect to Federal legislation and governmental actions that impact the System. Established by the Agricultural Credit Act of 1987, the Farm Credit System Insurance Corporation ensures the timely payment of principal and interest on insured notes, bonds, and other obligations issued on behalf of Farm Credit System Banks to the extent that funds are available. We welcome you to our website and invite you to learn more about the Funding Corporation and our contribution to U.S. agriculture as part of the Farm Credit System.